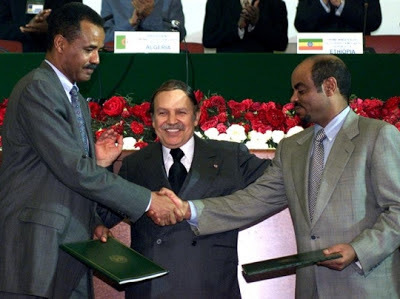 Nov. 17, 2012 — Since the demise of former dictator Meles Zenawi on August 20, a number of neighborly goodwill gestures have been conducted by Eritrea and Ethiopia, while at the same time, both governments are reportedly on heighten alert for all out war. Following the death of Meles Zenawi, who died from complications of late stage liver cancer in Belgium, Eritrea's deputy ambassador to the AU, Beniam Berhe, visited the Ethiopian National Palace and signed the book of condolences. The young diplomat was also seen comforting the grieving former first lady, Azeb Mesfin. Interestingly enough, during the same time period, Eritrea has suspended all Ethiopian opposition groups from airing news on their national channel Eri-TV. On its part, the Ethiopian government has freed dozens of Eritrean prisoners that were captured during Ethiopia's March 16 invasion of Eritrea, that reportedly killed more than 214 Ethiopian troops, according to one source with ties to the secretive Ethiopian National Intelligence and Security Service. Recently, during the election process at the UN for the Advisory Committee on Administrative and Budgetary position, It was reported that both Ethiopia and Djibouti voted for the Eritrean candidate, Tesfa Alem Seyoum. These crucial votes helped secure his victory over his rivals. Amid all this, South Sudan, which is tangled in its own border dispute with neighboring Sudan, said it will select delegates that will embark on shuttle diplomacy between Eritrea and Ethiopia. "We will embark on rounds of shuttle diplomacy between the two countries. We are hoping to start in November," said Deng Alor, South Sudan's minister for cabinet affairs. But among these goodwill gestures and early signs of peace, there are rumored reports coming out of Addis Ababa that Abay Woldu, the President of Tigray region of Ethiopia and the newly appointed Chairmen of TPLF, is trying to convince his party to invade Eritrea and annex its port city of Assab. Abay, who is described as a conservative Tigrayan nationalist, often speaks critically of Eritrea and Ethiopia during meetings. He, along with TPLF founder Sebhat Nega, are rumored to be in favor of going to war with Eritrea to create an independent Tigray state. They regard their minority Tigrayan hegemony over Ethiopia as unsustainable and dangerous for their people. Informed sources have said that Ethopia is amassing its troops in the Afar region bordering Eritrea, which could be a sign that the regime is still uncomfortable with peace. Addis Ababa's belligerent stance towards Eritrea continues to be a source of instability for the region. Only time will tell if cooler heads prevail, but with Meles gone and Ethiopia's regime split among rivaling factions, bravado towards Eritrea maybe seen as a sign of party loyalty for a small clique of Tigrayan men vying for power. Prime Minister Meles Zenawi in Algeria.